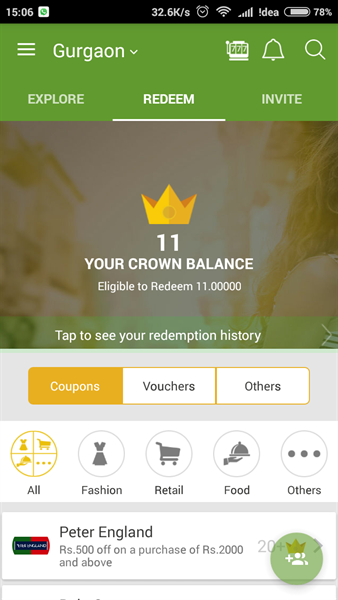 Crownit is a smartphone app to earn cashback and discounts. Read more about this app here. What exactly is a cashback and do they actually benefit shoppers? Today, cashbacks are the 'it' thing in the shopping scene. And why are they so? Simply put, they are a percentage of money returned after a purchase is made. Later, this cashback can be added for discounts on products. So, when it comes to shopping through modern technology, a cashback feature can be beneficial for shoppers. One app that truly defines this is Crownit. 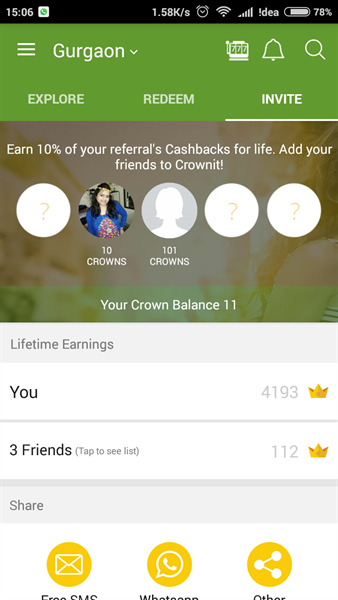 Crownit is basically a cashback app which provides user the chance to earn exclusive cashback from restaurants, spa, salons, fitness, hotels, diagnostics, movies, and more. The cashback users receive after availing services or products from these outlets are termed as Crowns. These Crowns can be redeemed for things like online shopping, recharge online, booking tickets etc. The process of earning cashback or Crowns is simple enough and straightforward. The app has thousands of outlets listed. Users can search or discover restaurants in Gurgaon, Delhi, Mumbai or Benglore as well as spas, salons, hotels, fitness etc. near them. Once they've availed the services from the outlet of their choice, an image of the bill should be uploaded to earn cashback. The cashback percentages on the Crownit app can vary with each outlet. Some may carry more cashback while others carry lesser. However, there are certain outlets called 'Star Outlets' which carry more cashback percentages. Either way, it is guaranteed that users will receive a certain cashback percentage. 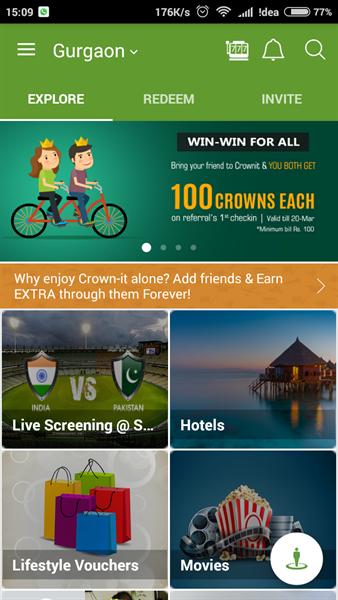 Crownit is currently live in Gurgaon, Delhi/NCR, Mumbai and Bengaluru. 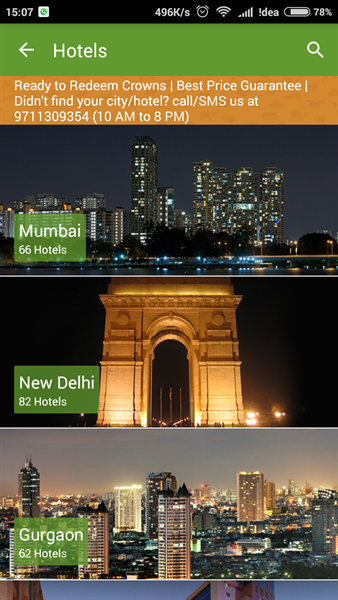 It also provides access to hotels in over 30 cities across India. Not only to major cities, it also provides services in Tier-2 cities such as Agra, Aligarh, Aurangabad, Chandigarh, Pondicherry, and others under its hotel category. 1. User-Friendly Interface - The app's interface is easy to use and quite convenient. One can just register for their Facebook account. There are no complications while navigating and searching. The user interface has a clean design of all the options. 2. Moderate Cashback - As mentioned above, the cashback percentage may vary with each outlet. But the cashback percentage is sensible. The cashback is then converted to Crowns. 3. Discounts on Online Stores - You can purchase vouchers or coupons for online stores such as Flipkart, Jabong, BookMyShow etc. with your Crowns. Then, you can simply avail these vouchers or coupons at the store's site or app. 4. Savings for a Rainy Day - Talk-time recharge or post-paid bill payment is one of the best redemption offers. Users get to recharge or pay their phone bills with their Crowns as well. This can come in handy on a rainy day. 5. Discovering New Outlets - The app's ability to discover new outlets for dining, entertainment, fitness or anything in the user's vicinity is convenient. 6. Top Online Stores Available - Some of the best online stores are listed on the app. This includes Flipkart, Amazon, Jabong, Peter England, book voucher and PVR cinema chain, just to name a few. 1. Image Quality - In case of outlets with dark ambiances, the image quality can be problematic. 2. No flexibility in search results - Once your location has been embedded, it becomes difficult to search for outlets in other cities. 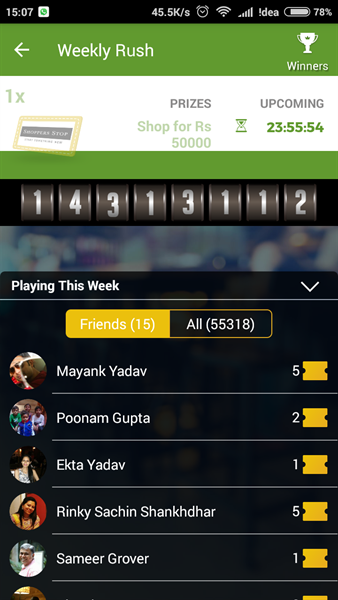 Weekly Rush - Apart from the curated purchasing features, Crownit also has a special feature called Weekly Rush. It was introduced in September 2015. It is a contest where users get a chance to win grand prizes. In the past, some of the prizes which were included are iPhones, Holiday Trips, Samsung S2, and other smartphones. Consolation prizes include vouchers and Crowns. So, how do users get to participate in the Weekly Rush contest? It's simple. When you make a successful check-in at an outlet, you receive tickets along with Crowns. These tickets have a unique set of numbers. Every Friday at 3 pm, users get to match their ticket numbers. In case of check-ins at 'Star Outlets', users get two Weekly Rush ticket instead one. The Crownit Wallet was introduced to users quite recently. This option allows users to transfer money into their wallet. They can then use this money to purchase vouchers and coupons, or make bookings through the app. This aims for an easy and quick transaction. One can download Crownit app from the App Store, Google Play and Windows Store. In addition to all of these, users can also post their reviews of a certain outlet on their Facebook profile. This can be done after a successful check-in. Download Crownit App for Android users. Dowload for Apple iOS users. Crownit is an app to hang on to. From the smooth streamlined user interface design to earning cash back, this little app is a gem. Not only does it give you the opportunity to save money, you also get the chance to win prizes through the Weekly Rush contest. You must give Crownit a try.